Also look at the comments underneath the blog by people ‘feeling the same pain’ – perhaps us extroverts should/could make a bit more of an effort to notice people with an introverted preference and respect their needs for less noise, smaller groups and meaningful conversation, including the occasional pause for thinking. Enjoy this post, especially if you have an introverted preference yourself! These days, there is a lot of talk about empathy – and indeed, for quite a few people it would be good to learn and develop their empathetic abilities more. Projects that focus on practicing empathy already with first-graders in school, whose brains still develop, are certainly good and useful. One example here is Roots of Empathy. However, there is a flip side to that coin that we rarely – basically: never – hear about, and that is: too much empathy. Empathy to the degree that one literally ‘feels’ other people too much or even only other people, but no longer properly one’s own needs. This can be an issue in helping professions, it can be an issue in coaching and consulting, and it can be an issue in our personal lives. It can go to the point of self-sacrifice. The medical basis for empathy lies in the number of mirror neurons one is equipped with. Mirror neurons help us with the ability to imagine things/contexts. And yes indeed, some people have difficulty imagining things. They literally ‘lack imagination’, find it stressful to even attempt to imagine things/concepts. They prefer observation of what is, what they can see, hear, touch. Fair enough. Also much needed, especially in hands-on professions. Some other people though are so richly equipped with mirror neurons that they imagine things too well – they hear somebody talking about a tooth ache and literally feel that tooth ache themselves. They read about somebody fainting from pain or illness and almost faint themselves. They tend to say: “I feel other people too much” or “I’m just a highly sensitive person”. I have had to learn the hard way that it is indeed much less ‘poetic’ than that: It is simply so that there is too much ability to imagine things. In full complexity. You are not actually ‘feeling’ the other person’s pain or feelings or anger. You are just too good at imagining things. So sometimes, it helps to step back, look inside yourself and ask: “So what do I actually feel? And what do I actually want and need right now?” And to stop thinking about that person or that situation that triggers the imagination. Literally take your mind off it. Switch and return to yourself. For people with ‘too much empathy’ that can be a necessary exercise. It doesn’t mean that you will lose your compassion. It’s simply about consciously developing ‘good enough’ boundaries, turning away a little instead of turning towards. We’re supposed to be connected – and sometimes it’s okay and even healthy to be a bit separate. Try and find your own good ‘middle ground’. A powerful message in there that I personally took with me: We need to accept that we can no longer necessarily impose our own meaning-making on children, but that we need to allow them their own meaning-making – even if that leads to perspective change for us. Eine starke Botschaft des Films, die ich für mich selbst mitgenommen habe: Wir müssen akzeptieren, dass wir nicht länger unbedingt unsere eigene Deutung der Dinge den Kindern aufoktroyieren können – sondern dass wir ihnen ihre eigene Sinnfindung und Deutung der Dinge erlauben müssen, auch wenn das für uns Perspektivwechsel bedeutet. It’s been a while since I saw it, yet it came to mind again, and I thought it deserved a short blog post: The sustainability-focused theater play ‘Water’, which was staged in London/England’s Tricycle Theatre. “(The) piece begins with a lecture about the properties of water and how – like this uniquely gregarious molecule – the human race must pull together against its own nature in order to preserve the planet. The play is excellent and, although set in 1981, still feels timeless and acutely relevant – I wish it could be seen in more places! The quote is by Stephen Hawking. I just have to share here his opinion piece in the Washington Post of February 14, 2014, because it is so well and importantly worded. A MUST-read for all! He urges the international community, all of us, to end the war in Syria, and lobbies for a sense of collective justice – and against ever more setbacks for human civilization. Please read! 2012, or MMXII, is a Sunday child – the year started on a Sunday. As the nursery rhyme goes, “the child that is born on the Sabbath day is bonny and blithe, and good and happy“. How did 2012 turn out for the world? And how was the year for you personally? In terms of how we interact with each other, this year we experienced the Greek government’s debt crisis; worried more about Iran’s nuclear plans; too silently witnessed atrocities in Syria’s civil war, Egypt struggling with democracy, and Israel and Palestine ending their truce. I may not be alone in wondering about the future: Are we standing still? Are we going down an apocalyptic path, or do we make transformational choices? Personally, I am excited to now start work with colleagues who research on ’Harmonic Vibrancy’ – the perceived quality of relationships within an organization. Their research is part of what they call ’Ecosynomics’: The Science of Abundance and the Principles of Collaboration. In terms of future trends, that’s where they see the emphasis. I would like to apply the concept of Harmonic Vibrancy to the notion of sustainability: To me, sustainability is, quite simply said, about the quality of relationships – those we have with those closest to us, with colleagues, with stakeholders and … with the environment. One is a cook who spends almost every free minute at a children’s hospice, trying to ‘bring a smile to the faces of these terminally ill children’. The second is a married mother of three who serves as a surrogate mom to babies given up directly after birth in a so-called ‘baby flap’ (drop-off box). She has already nursed eight babies, each for two months, until each baby could be adopted. Her family supports her in this 24/7 job. She just wants to “be the mom to them that each one of these babies deserves to have”. The third is a rocker who ‘used to solve problems with my fists – now I solve them with my heart’. After losing his own young wife to cancer at the age of 28, he convinced his motorcycle gang to create and operate with him an adventure park for sick and disabled children – there is even a tree house with wheelchair access! These three silent heroes are volunteers – coincidentally, 2011 was the European Union’s Year of Volunteering. Our societies could not exist without the giving spirit of volunteers – giving generously of our time, our skills, our dedication … our hearts. Li Edelkoort, one of the world’s most renowned trend forecasters, has predicted the end of Western-style individualism, and a (re-)turn to a communal sense of identity. This New Year’s Eve, we attended a party in the snow-covered hills of the Wittgensteiner Land in Germany. At midnight, spectacular fireworks over a snow field in front of the forest, accompanied by music. And they were serving champagne, hot punch, doughnuts and – sauerkraut! – outside. 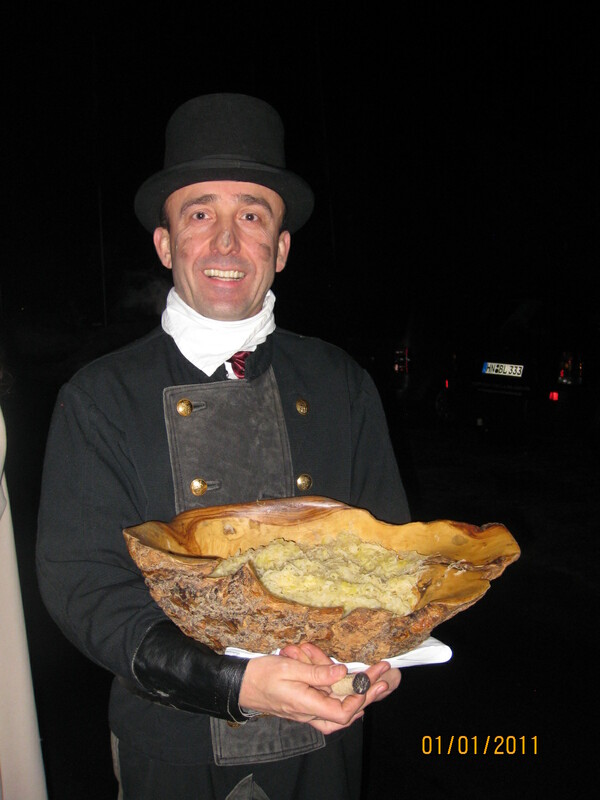 The sauerkraut is apparently a local custom for good luck in the new year, and it’s served by a chimney sweeper, for double good luck. To all of you, I wish you the very best for 2011 – health and happiness, love and laughter, prosperity and personal growth!